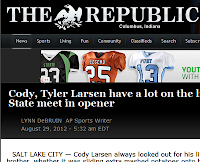 SALT LAKE CITY — Cody Larsen always looked out for his little brother, whether it was sliding extra mashed potatoes onto his plate or calming his nerves when he made his first start as a high school freshman. That all changes Thursday as the two linemen go head to head for the first time when Southern Utah travels to Logan to take on Utah State in the season opener for both teams. Tyler has started 25 straight games at center for Utah State and earned first-team all-WAC honors in 2011. This is the second straight season he's on the watch list for the Rimington Trophy, given to the nation's top center. Cody, 24, is a two-time first-team all-Great West Conference honoree and three-year starter on the defensive line for Southern Utah.